March 1, 2009 saw elections at several levels in 79 Russian regions. People went to the polls to elect regional and city parliaments, mayors and local representative bodies. In seven of nine regions, the United Russia party won legislative assemblies. Often referred to as the "power party," United Russia was the brainchild of Vladimir Putin, who is also its head (without being a member). It commands an overwhelming parliamentary majority and has many governors. The Russian media never doubted for a minute that UR was the hot favourite, yet they watched the results closely because of the economic crisis. The level of trust in UR indicates the level of confidence in the government as a whole. Many doubt the elections were entirely legitimate and suspect voters came to the polls under administrative pressure. In fact, the authorities and the UR leadership fuelled these suspicions themselves. The Vedomosti newspaper (published jointly with the Financial Times and the Wall Street Journal) reports that high-ranking UR regional functionaries were rewarded or punished on the basis of election results. For example, the governors of the Tver and Smolensk Regions were reprimanded by the party for losing elections in those regional centres, while the secretaries of the city and regional party branches in Tver were told to resign. The independent weekly Rossiiskiye Vesti notes the deputy head of the presidential administration's internal policy directorate, Alexander Kharichev, who was in charge of work with the Russian regions, resigned shortly after the elections. This reshuffle of the Kremlin Administration occurred immediately after election results were reviewed, although this was officially declared to be a mere coincidence. The opposition newspaper Sovetskaya Rossiya lent its pages to Gennady Zyuganov, the CPRF leader: "If the elections had been free and fair, the Communist Party would have gained at least a third of votes." 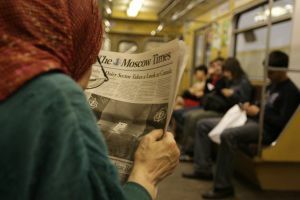 The Russian Communist Party newspaper Pravda claims that "at least since 1999, the entire electoral system in Russia has been completely under official control. Instead of the declared 'free and fair democratic elections,' each time we witness a show orchestrated in detail by Kremlin puppeteers, embracing all government authorities, all electoral commissions and the government-controlled media." Government newspaper Rossiiskaya Gazeta carried an interview with the head of the Central Electoral Commission, Vladimir Churov, who noted the elections had generally been well organised and that, in spite of the crisis, campaign funds of various parties had increased and voter turnout had exceeded expectations. The independent Kommersant writes "the outcome of the elections suits all parties that took part." UR described the vote as a success; small parliamentary parties went through the motions of complaining about use of administrative resources, but declared the elections marked the end of UR's monopoly. The Presidential Administration is also pleased with the outcome: top officials say the elections demonstrated the political system works and is capable of coping with the crisis. Russian-American relations: reset or overload? On the eve of the first official meeting between Russia's Foreign Minister Sergei Lavrov and US Secretary of State Hillary Clinton, the Americans committed an unfortunate linguistic gaffe. Trying to transcribe the word "reset" into Russian, they misspelt it and wrote 'peregruzka' instead of 'perezagruzka'. In Russian, "reset" became "overload". Lavrov turned it all into a joke, drawing laughter from the audience. The Russian media were also amused by the slip-up, but there was no unanimity about the prospects for bilateral relations. Deputy Director of the RAS US and Canada Studies Institute, Victor Kremenyuk, made this comment in Rossiiskiye Vesti: "The Bush Administration has left many logjams in Russian-American relations, which will not be easy to remove. One is Iran, being tied in with many problems, including missile defence. This is part of the reason why relations between Washington and Moscow have been tense recently, occasionally harking back to the Cold War." "The time has now come to take a long, hard look at the situation and try to take advantage of every opportunity to turn things around. The American side has indicated it wants to do this and Moscow takes a similar position," Kremenyuk continued. "Nevertheless, the example of Iran has shown American diplomacy does not easily change its mentality. At official level, the US never recognises that anyone else has any special interests. Yet, in reality, Washington is aware that every country, including Russia, has its zones of interest to be reckoned with. Russia's existence cannot simply be ignored. If America really want good relations with our country, it will have to admit Russia has serious interests close to its borders and act accordingly." The business newspaper RBC Daily (published together with Khandelsblatt) writes the Lavrov-Clinton meeting "was devoted not so much to solving as to identifying problems that have piled up in bilateral relations. They stated the links between Russia and the US were "overloaded" and needed to be "reset," for which purpose a bilateral commission, co-chaired by Russian Prime Minister Vladimir Putin and US Vice President Joe Biden, would be set up. Kommersant, citing a source at the Russian Foreign Ministry, writes that "a constructive agenda is to be prepared for the meeting between Presidents Dmitry Medvedev and Barack Obama, scheduled to be held on the fringes of the G20 Summit on April 2." The nationalist opposition newspaper Zavtra claims: "During the talks between Hillary Clinton and Sergey Lavrov, Russia agreed in principle to reduce its strategic nuclear forces to 1000 warheads, which lends relevance to further expansion of the American defence system and increases the likelihood of conventional, i.e. non-nuclear, aggression against the Russian Federation." Such a 'peregruzka' in relations with the US may prove too much for the Russian vertical power structure, especially since the strategy of "managed local conflicts," as exemplified by Kosovo and Chechnya, is a hallmark of America's "democratic" foreign policy, while the global crisis has brought the situation in many Russian regions to flashpoint. This is particularly true of the "national regions," where the situation is likely to become ever more explosive in the coming months.